It’s cold here in New York…I just want to flop on the couch and watch Victoria with a big cookie and a warm drink. Cabin-Fever Caramel Banana Bars make fine TV snacks, although I have to say that this is a cake recipe, not a cookie recipe. But I won’t quibble over semantics– these are yummy, whatever they’re called! 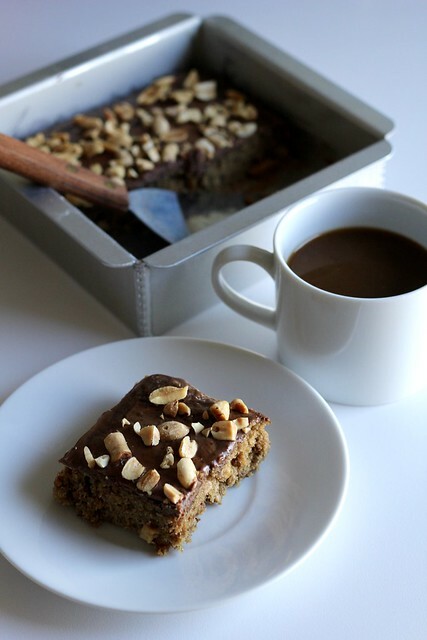 The base is a moist brown sugar banana cake that I think would be just as great plain as it is topped with melted chocolate and nuts. The only tweak I’ll make to this next time is that I’ll leave the chopped peanuts out of the cake itself and just keep them on top. Or maybe I’ll do away with the nuts entirely, swipe Mardi’s idea and sprinkle the bars with 100s and 1000s instead. Yours look so good! I love how differently everyone interpreted these! Can I just say those look DELICIOUS! They remind be of Banoffee Pie but in a much easier to eat form! Thanks. These look like a delicious combo! These were delish, but I agree, quite cake-like. Yup definitely cake not cookie but great just the same. I hope it thaws out a little for you in NY.